The hazards of exposure to welding fumes, dust, and vapours in the workplace is a serious health risk, and with ever changing workplaces the need to reduce energy costs and meet environmental issues is key. Extractability Portable or fixed filtration units can assist in meeting these matters. Fixed filtration units for fumes, dust, and vapours can save valuable work space and can be located inside or outside the factory/workshop. Mobile fume extractors provide increased flexibility, It makes extraction at various workplaces and locations possible. ProtectoXtract is a BGIA approved mobile high-vacuum extraction system for filtration of particulate fumes, dusts and some gases. The ProtectoXtract uses a 5-stage filtration system, with replaceable filters and is quiet in operation 68dBA. The ProtectoXtract is supplied with 3m suction arm, hose with internal joints, filter and provides air movement of 2500 m3/h. Compliant with DIN EN ISO 15012-1, so is suitable for category W3 stainless welding fumes 30 NiCr. The ProtectoXtract is a mobile unit, weighing only 80kg and is supplied on swivel casters for manoeuvrability. Options available for a 110v or 230v mains input supply. IMPORTANT - When used with processes that produce spatter and/or grinding sparks, the optional ProtectoSpark Filter (EXT978013) must be used. ProtectoXtract Twin is a FDA approved mobile high-vacuum extraction system for filtration of particulate fumes, dusts and some gases. The ProtectoXtract Twin uses a 2 stage filtration system, with replaceable filters and is quiet in operation (<72dB[A]). The ProtectoXtract Twin is supplied with 2 x 2m, 3m or 4m suction arm, hose with internal joints, filter and provides air movement of 3500 m3/h. When used with processes that produce spatter the optional aluminium pre-filter must be used. Compliant with DIN EN ISO 15012-1, so is suitable for category W3 stainless welding fumes (>30% Ni+Cr). The ProtectoXtract Twin is a mobile unit, weighing only 130kg and is supplied on swivel casters for manoeuvrability. Operates from a 415v mains input supply. ProtectoReclenz is a BGIA approved mobile fume filter type UPF-BIA class W3 incorporating a separator. Features a durable large surface area filter cartridge with PTFE laminate, complete with audible and visible filter monitor, rotational direction indicator and hour meter. ProtectoReclenz Twin is a BGIA approved mobile welding fume filter IFA certified class W3 incorporating a separator. Features two durable large surface area filter cartridge with PTFE laminate, complete with audible and visible filter monitor, rotational direction indicator and hour meter. The unit is capable of handling up to 3500 m³/hr and is complete with a 2 x 2, 3 or 4m 150mm diameter hose type arm with internal support structure. The unit has a 2.2 KW fanset and is supplied with a 5m mains input cable and plug. The unit comes with 2 filter cartridge that can be easily cleaned quickly and easily with compressed air. This mobile unit weighs only 150 kg and is supplied on swivel castor's for manoeuvrability. ProtectoAutoclenz is a self cleaning mobile fume filter type PF incorp-orating a separator, a durable large surface area filter cartridge, and complete with a filter monitor, post-cleaning function and hour meter. The unit is capable of handling up to 3000 m³/hr and is complete with a 2, 3 or 4m 150mm diameter hose type arm with internal support structure. The unit has a 1.5 kW fanset and is supplied with a 5m mains input cable. ProtectoAutoclenz weighs 160kg and is supplied on swivel casters for manoeuvrability. ProtectoAutoclenz Twin is a self cleaning mobile fume filter type PF incorporating a separator, two durable large surface area filter cartridge, and complete with a filter monitor, post-cleaning function and hour meter. The unit is capable of handling up to 3500 m³/hr and is complete with a 2 x 2, 3 or 4m 150mm diameter hose type arm with internal support structure. The unit has a 2.2 kW fan-set and is supplied with a 5m mains input cable. ProtectoAutoclenz Twin weighs 190kg and is supplied on swivel casters for manoeuvrability. ProtectoTwin is a twin high-pressure turbine with infinitely adjustable speed control specifically designed to extract and filter metal particulate fumes created in welding processes. The ProtectoTwin is supplied with a 2.5m hose and magnetic foot welding nozzle. The EcoCube product line is a filter unit equipped with filter cartridges applicable for nearly every task in the area of fume and dust filtration. The polluted air is extracted by means of the ventilator and guided towards the filtering section. The toxic particles are deposit on the surface of the filter cartridges. The cartridges are cleaned automatically by compressed air. The particles deposited on the cartridge are detached by the compressed air blast and reach a dust collecting tank. The cleaned air is recycled to the working space without any heat loss. The main parts of the EcoCube are the fan, pneumatic housing, filter section including cartridges, sparklatch and dust collecting section as well as the control unit for filter cleaning. The system will be delivered ready for connection. Only the system modules must be placed and connected. ProtectoXtract Wall Filter is a FDA approved wall mounted welding fume extraction system for filtration of particulate fumes, dusts and some gases. The ProtectoXtract wall unit uses a 2 stage filtration system, with replaceable filters and is quiet in operation (<70dB[A]). The ProtectoXtract Twin is supplied with a 2m, 3m or 4m suction arm, hose with internal joints, filter and provides air movement of 2500 m3/h. When used with processes that produce spatter the optional aluminium pre-filter must be used. Compliant with DIN EN ISO 15012-1, so is suitable for category W3 stainless welding fumes (>30% Ni+Cr). The ProtectoXtract wall unit weighs only 122kg and operates from a 415v mains input supply. ProtectoXtract Wall Twin is a FDA approved wall mounted welding fume extraction system for filtration of particulate fumes, dusts and some gases. The ProtectoXtract wall unit uses a 2 stage filtration system, with replaceable filters and is quiet in operation (<72dB[A]). The ProtectoXtract Twin is supplied with 2 x 2m, 3m or 4m suction arm, hose with internal joints, filter and provides air movement of 3500 m3/h. When used with processes that produce spatter the optional aluminium pre-filter must be used. Compliant with DIN EN ISO 15012-1, so is suitable for category W3 stainless welding fumes (>30% Ni+Cr). The ProtectoXtract wall twin arm unit weighs only 142kg and operates from a 415v mains input supply. ProtectoAutoclenz Wall Twin unit is a self cleaning wall mounted welding fume filter incorporating a separator, two durable large surface area filter cartridge, and complete with a filter monitor, post-cleaning function and hour meter. The unit is capable of handling up to 2500 m³/hr and is complete with 2 x 2, 3 or 4m 150mm diameter hose type arm with internal support structure. The unit has a 2.2kW fanset and is supplied with a 5m mains input cable. ProtectoAutoclenz wall unit weighs 165kg. The ProtectoCube 2N is suitable for various suction problems at several working places at the same time for work involving unalloyed metals and precious metals, galvanized material and aluminium. 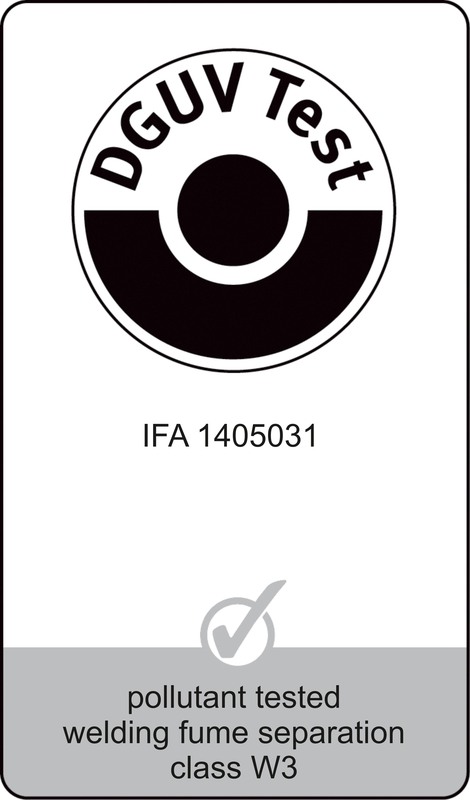 The unit is IFA certified for welding fume class W3. The released fumes and dusts are extracted via appropriate suction elements and guided into the filter unit. A baffle plate with a large surface serves as pre-separator and distributes the particles on the whole filter surface. All filter units are fitted with hanging filter cartridges. There for, the admission of the cartridges is carried out on the side. Heavy particles fall down directly into the dust container. The ProtectoCube 4N - 4H is suitable for various suction problems at several working places at the same time for work involving unalloyed metals and precious metals, galvanized material and aluminium. The unit is IFA certified for welding fume class W3. © Extractability. CE Approved. All Rights Reserved.